Importance of understanding the location dynamics is slowly gaining momentum as it is a key factor in understanding and practising sustainable development. Understanding the economy of a place, its social structure and its environment needs a comprehensive information system. But designing such a comprehensive system is a multi-disciplinary effort where it involves not only engineers with technology background but also social engineers who understand the delicate social structures, their diversities and economics of a region. KAIINOS is trying to build such comprehensive geographic information systems (GIS) by working with organizations/enterprises in the domains of environment, ecology, policy making and urban administration. if an X% increase in per-capita income leads to P% increase in population growth – where does the extra population land. We tried to simulate some of these challenges for Hyderabad using the estimates of IPCC SRES scenarios. The primary challenge in designing these models is in scaling down the aggregate parameters to the minimum geographic unit. As we can see from the simulation results, different policy decisions might affect the location dynamics of urban agglomerations in a completely different way. Simulated Urban Land use – 2030 . High Economic Growth rate assumed. Growth in the direction of NE. Simulated Urban Land use – 2030 . Sustainable balanced growth assumed. Growth distributed all around city. Spatial Data Infrastructure (SDI) helps organizations in understanding the location dynamics of their activities. 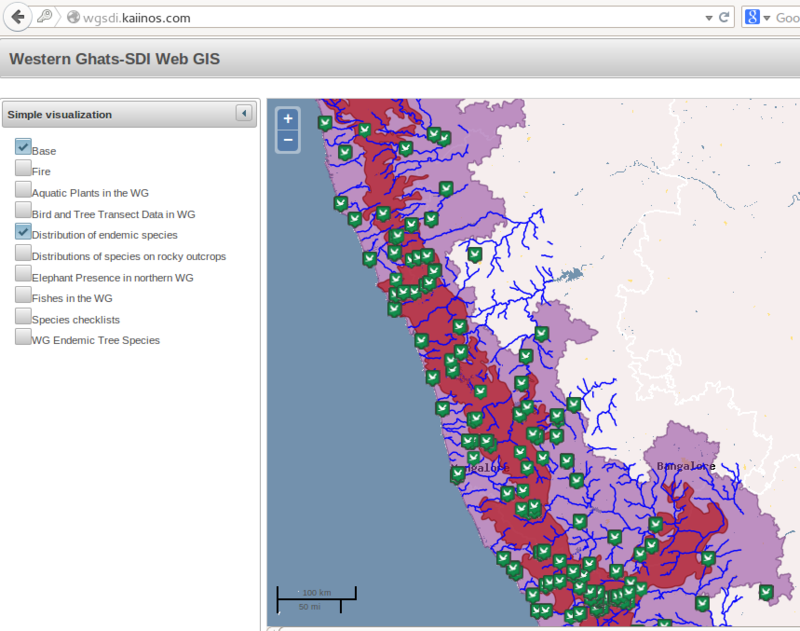 KAIINOS deployed SDI for western ghats of India to enable Environment Impact Assessment (EIA). Government agencies, NGOs and other environmental groups which perform EIA, use the tools and data of this SDI. In the first phase of this project OSGeo India has given us crowdsourced data. All this data has been stored as a spatial database and then rendered as OGC compliant web services. The goal is to run the portal of SDI as a collaborative platform where users can access data, calculate parameters such as Richness index of a species, update the data through Kriti mobile application. Bhuvan and Survey of India WMS services has also been integrated into this SDI. Simple layer visualizations and species cluster visualizations, of the underlying spatial data, have been provided as part of this phase. In the next phase of SDI analytical tools to perform on the fly cluster analysis, classification of data, socio economic integrated analysis will be developed. Another goal of development is to make the data, design documentation, source code of SDI open so that it can help in customizations by other groups to bring in different perspectives from different domains. Also by bringing in transparency, this process of performing EIA using SDI can be adapted in other regions of India and elsewhere in the world.